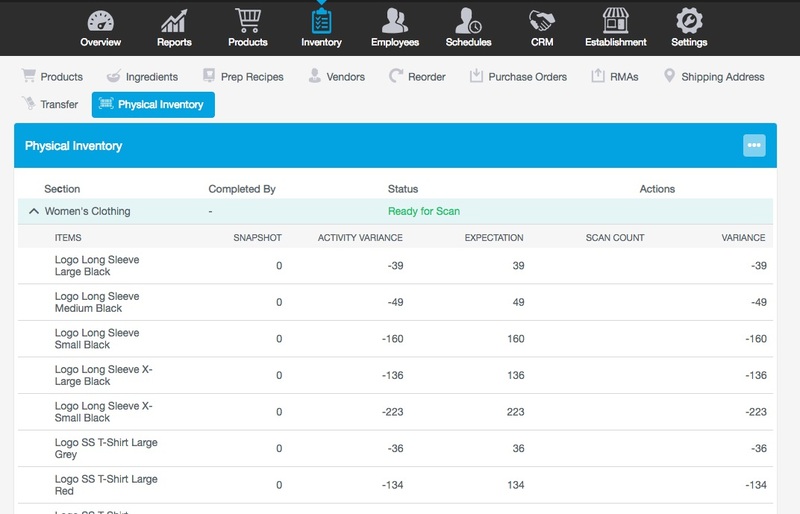 Revel now supports a Physical Inventory functionality that allows users to divide their stores into sections so that they may easily be inventoried. Store associates are assigned to count each section in order to submit the final count(s). The purpose of dividing a store into sections is so that if an actual scan count of a store doesn't match the expected count, it is easier for the manager to correct errors within a small section as opposed to finding errors in an entire store. NOTE: The physical inventory itself is done on the Revel Inventory App and requires a separate paid subscription. Please contact support if this is something you're interested in. From the Management Console (yourdomainname.revelup.com), navigate to Settings. Use the Clear Selections option and search Physical Inventory. Check the two boxes to display/edit those settings on the right. Require Count by Scan: If checked, the system will require that each item in a section be scanned as a method of counting. If unchecked, associates will not be required to scan items to count and will only be required to enter a count by hand. Under Employees, choose Permissions, then select Management Console Permissions to set up permissions for Administrative access to Physical Inventory on the Management Console. 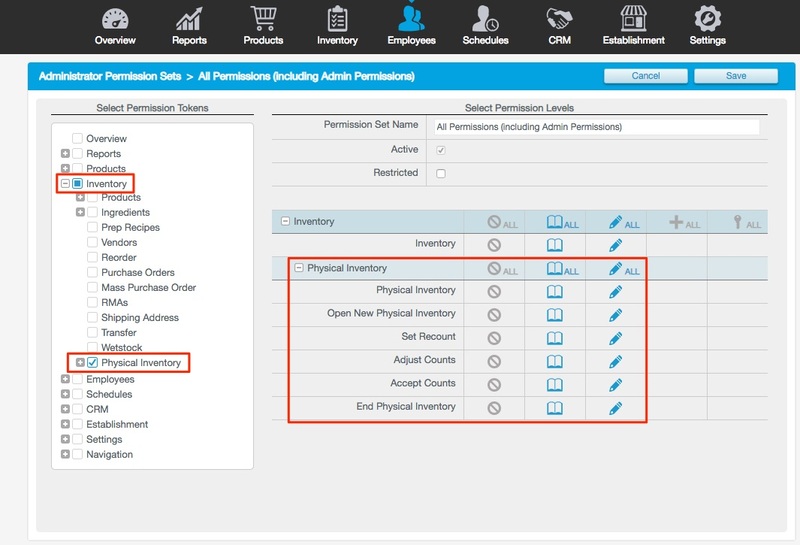 Under Employees, choose Permissions, then select POS Role Permissions to assign role permissions for Physical Inventory to each appropriate employee role. 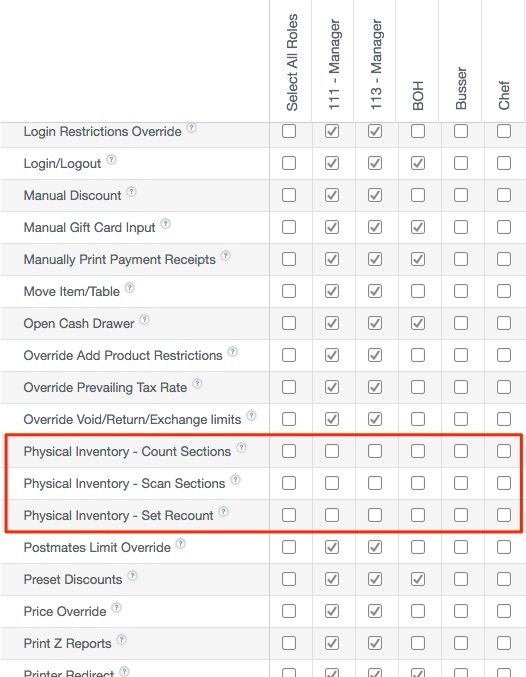 Physical Inventory - Count Sections If checked, user will be allowed to perform manual section counts. This is dependent on whether or not manual counts are required as a step in the physical inventory. Physical Inventory - Scan Sections If checked, user will be allowed to scan products in a section to perform inventory stock-take. Physical Inventory - Set Recount If checked, user will be able to remove counts for a specific section and require that the section be recounted and rescanned. Navigate to the Inventory page in the Management Console and click the Physical Inventory button. This will open up the Physical Inventory page, allowing the user to create a new physical inventory session. After your page is saved, your inventory count sections will automatically display. 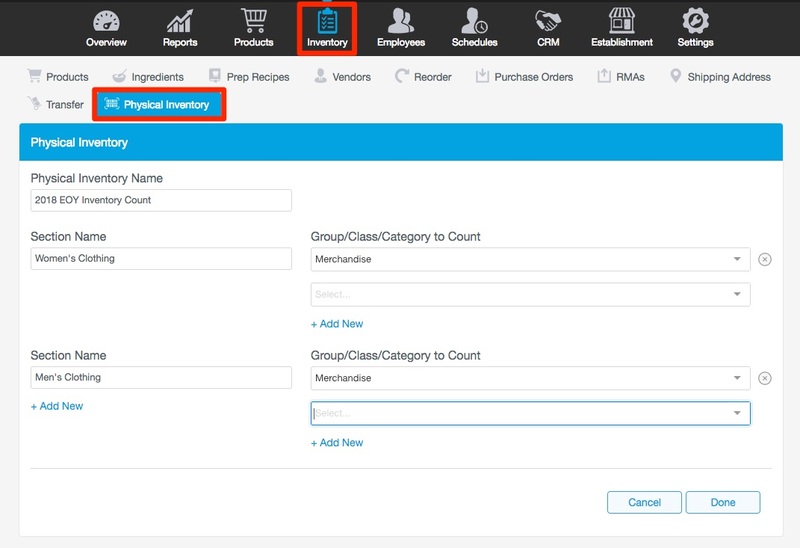 Use the arrow to expand and/or minimize each section to view your counts for individual products. 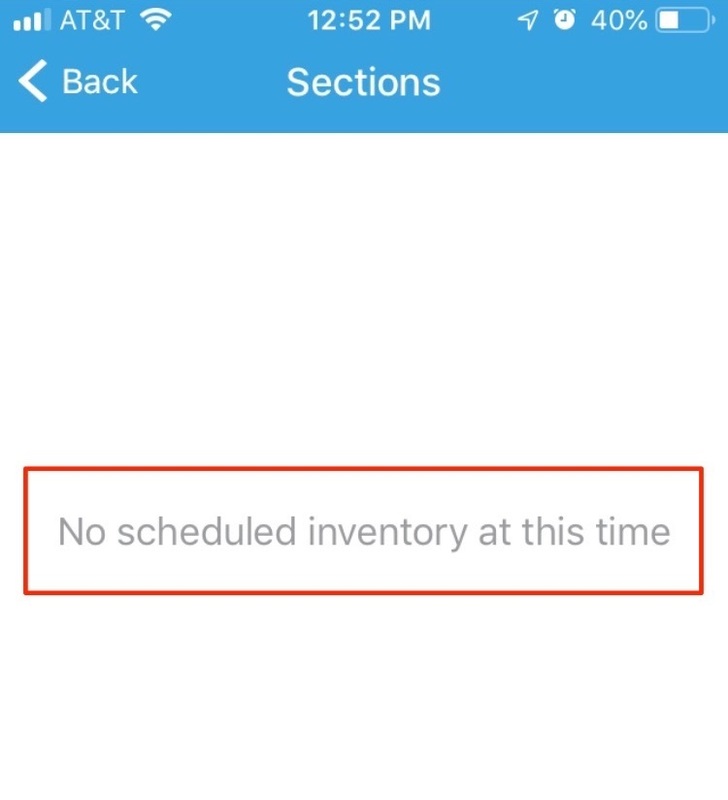 Once the user creates the sections for Physical Inventory, the system sends the Physical Inventory data to the Inventory app, allowing the user to begin the count / scan. First, be sure to download the Revel Inventory App through the iTunes Store by searching Revel Inventory. Once the app finishes downloading, you'll need to login to the app as a manager using the same credentials you use to access the Management Console. 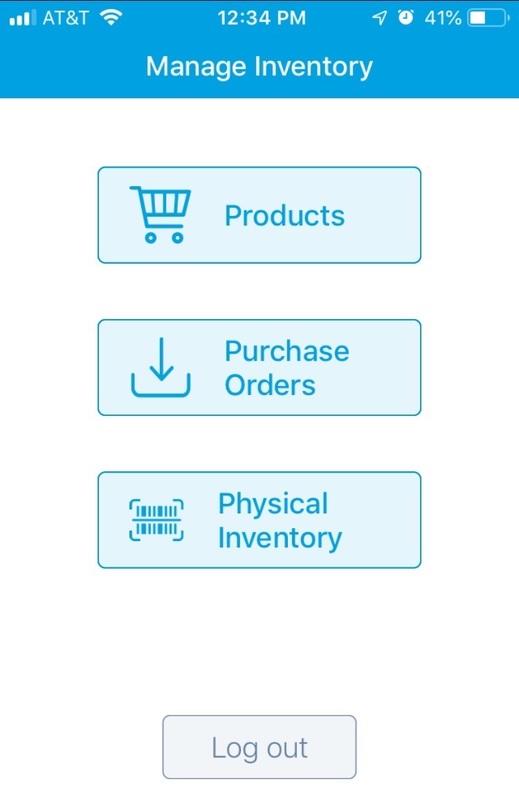 Products: Allows you to search for products on the application to manage the inventory qualities for that particular items. Purchase Orders: Allows you to view Purchase Orders that have already been created on the management console and mark items as received. Physical Inventory: Allows you to manage the Physical Inventory sections you created on the Management Console using the steps above. 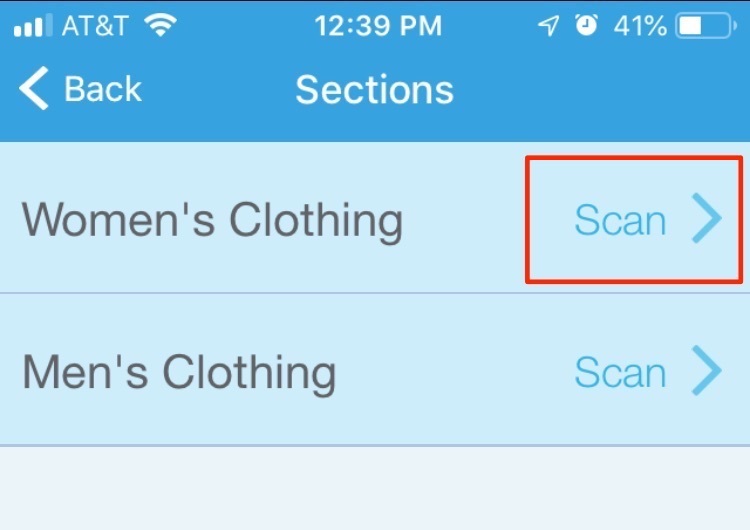 Note: Tapping "Scan" on any one of the sections will allow the user to physically scan each barcode to populate the section count. The application will respond with a short beep and a single quick vibration with each scan that requires no user interaction. A user can enter in several counts for a barcode and the application shall sum the addends. 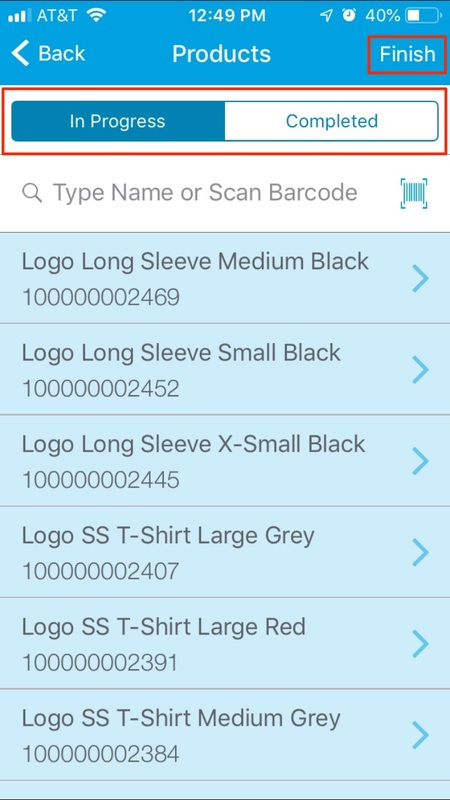 In addition to scanning with a wired scanner, the Physical Inventory functionality also supports a bluetooth scanner or an iPhone's internal camera as a barcode scanner. Swiping left on a product and tapping "Delete" will delete the corresponding count. Tapping a product will allow the user to edit the quantity of the product count, as shown in the images below. If a product cannot be found via barcode scan, an "Unknown Products" dialog message (in red) will appear at the top of the screen. 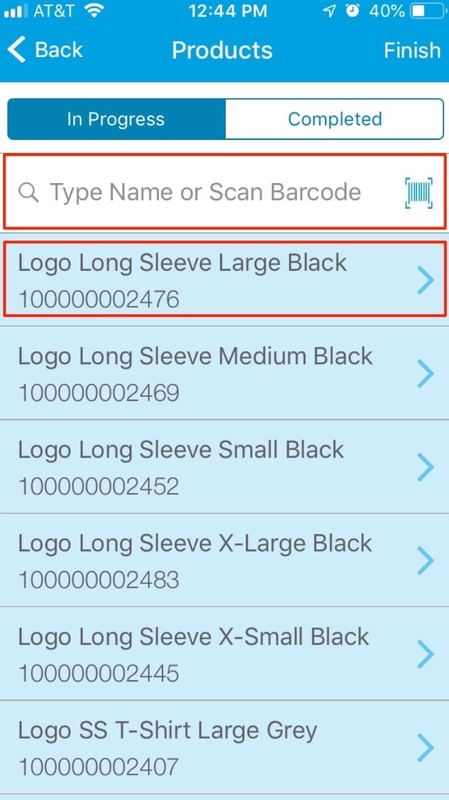 If two or more products have identical barcodes, a "Multiple Matches Found" dialog window will appear, allowing the user to select the desired product from a list. 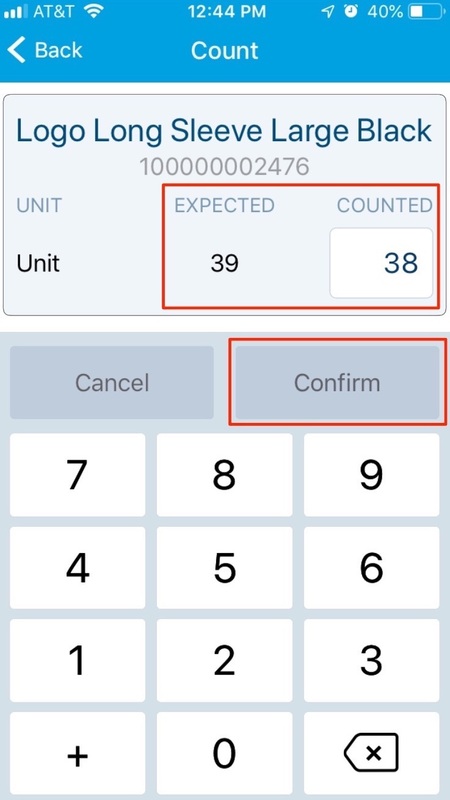 If a product has multiple units of measurement, a "Multiple Units Found" dialog window will appear with a list of various units to select from. All the examples mentioned here can be seen in the images below. Note: Only one Physical Inventory session will be open at a time. Depending on the Physical Inventory settings and role permissions which the manager has set up in the Management Console, the user (store associate) may or may not have access to certain functionality. Go to Inventory and Choose Physical Inventory. You'll see the sections you created previously with an option to Recount or Accept the counts. Once you have accepted all sections, you can choose End Physical Inventory. When finalized, you'll get a message Physical Inventory Finished. Note: Users may NOT click the recount button when the Physical Inventory is in the 'count complete' state. 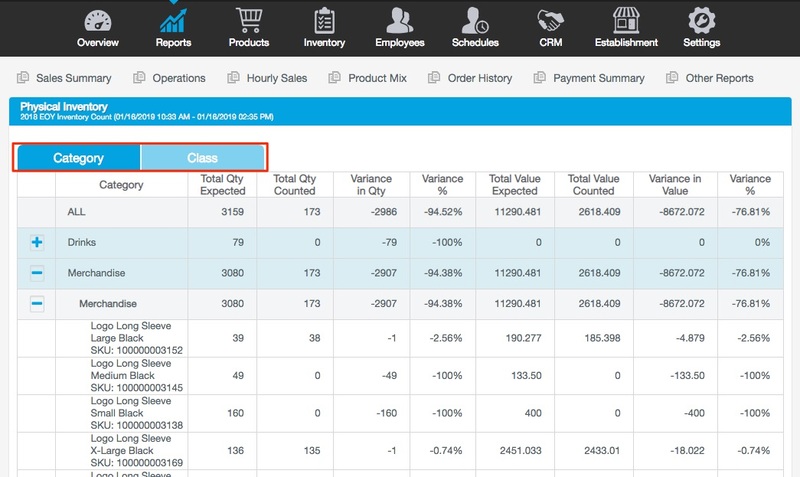 Clicking "Finalize Counts" completes the inventory count, allowing users to view the information on Reports. You can view your Physical Inventory history on the Physical Inventory Report, located under Reports; choose Other Reports, then select Physical Inventory History. This report shows results for each completed Physical Inventory count cycle. The report summarizes the expected count versus the actual count (variance). Once a Physical Inventory count has been finalized, the counted inventory number will be the actual inventory amount listed on the Management Console. For example, if 10 apples are listed in actual Inventory (in the Management Console), but only 8 apples are counted in Physical Inventory, your actual inventory number will change from 10 to 8 apples. As a result, 2 apples will be marked as Waste or Damaged. On the contrary, if 8 apples are listed in actual inventory, but 10 apples are counted in physical inventory, the actual inventory will be over ridden to 10 apples. As a result, 2 apples will be marked as Received. Please note that products NOT counted in Physical Inventory will not be modified in actual Inventory in the Management Console. Don't complete the Physical Inventory until you can find the items that were not counted. Set the count to "0" for all of the products which were not counted. Pause the count to continue the action at a later time.